The Hill reports more than half of the memos the former FBI director kept regarding his conversations with the president have classified material. 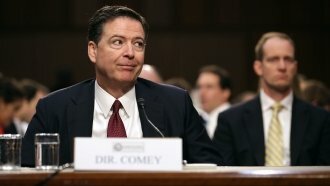 Former FBI Director James Comey previously revealed he kept records of his conversations with President Donald Trump. Now, The Hill reports more than half of those memos have classified information, according to anonymous sources. Those sources say these new details were revealed when the memos were shared with Congress. And they told The Hill four of Comey's seven total memos were either marked "secret" or "confidential." In June, we learned why Comey kept records of his conversations with Trump. 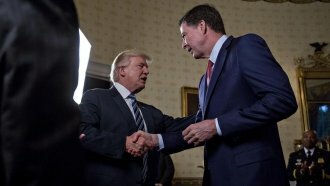 "I was honestly concerned that he might lie about the nature of our meeting, and so I thought it really important to document," Comey said. And we learned why Comey shared one memo with a friend. "I asked a friend of mine to share the content of the memo with a reporter. I didn't do it myself for a variety of reasons, but I asked him to because I thought that might prompt the appointment of a special counsel," Comey said. The friend shared the memo with The New York Times. It was about a Feb. 14 meeting, where Comey said Trump asked him to stop investigating former national security adviser Mike Flynn. Despite Trump's tweet Monday about Comey leaking "classified information to the media," it's important to note we don't know if the specific memo Comey shared was one of the four that reportedly had classified information. In his Senate testimony, Comey said he tried to keep classified info out of his memos. But classified or not, all FBI employees sign an agreement barring them from disclosing certain material without written consent. And The Hill reports the FBI considers all of Comey's memos to be government documents. The agreement reads: "All information acquired by me in connection with my official duties with the FBI and all official material to which I have access remain the property of the United States of America. ... I will not reveal, by any means, any information or material from or related to FBI files or any other information acquired by virtue of my official employment to any unauthorized recipient without prior official written authorization by the FBI." It isn't yet known if Comey signed this same agreement as FBI director. It's also unclear what the consequences are for sharing such information without permission. Comey handed over his memos to special counsel Robert Mueller, who's leading the FBI investigation into Russian meddling in the 2016 U.S. presidential election.